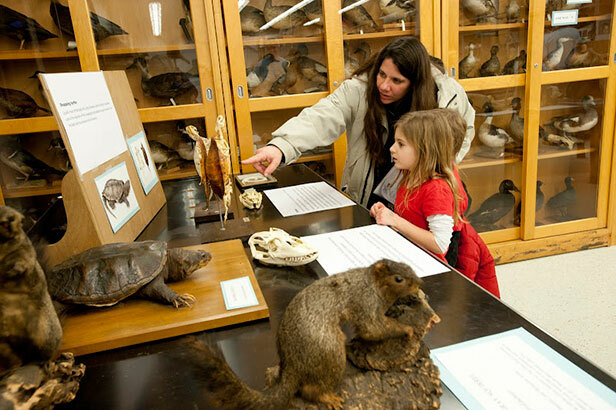 The Ohio State University Museum of Biological Diversity (MBD) comprises the biological specimen collections at Ohio State (except fossils). A unit within the Department of Evolution, Ecology and Organismal Biology, its primary mission is devoted to the preservation, documentation, scientific study, and interpretation of biological diversity and the training of the next generation of biodiversity scientists. On one Saturday each April, the doors of the Museum of Biological Diversity are open to the public for the highly-anticipated MBD Annual Open House. Museum curators work feverishly for weeks to plan a lively celebration of biological diversity for kids of all ages. Special displays, live animals, refreshments, and multiple hands-on learning activities fill the museum with color, life, and “oohs,” and “ahs.” Step through the doors and you are welcomed by scientists and staff eager to share their museum and talk about what they do that makes a difference. Biological research museums have a mission similar to that of libraries, but instead of preserving books, biological collections preserve individual organisms. The acarology collection is considered one of the best and most extensive tick and mite collections in North America. Over 150,000 determined, and more than one million undetermined specimens, are included, preserved either in alcohol or on microscope slides. The geographic range is worldwide. The collections get extensive use during the annual Acarology Summer Program, the foremost training workshop in systematic acarology in the world. One of the leading collections of animal sounds in the United States. The laboratory’s collection now contains more than 23,000 recordings of 876 species of birds and more than 2000 recordings of 160 species of arthropods. Recordings of mammal (96), amphibian (67), fish (3), and reptile (10) species are also part of the collection. Houses over 500,000 collections of plant and fungal specimens. The oldest, dating from 1840, was donated by William Sullivant, who helped establish Columbus as Ohio’s capital. The Herbarium library includes the Randolph collection; a rare book collection that contains volumes from the sixteenth century onwards. The animal colelctions are organized into six divisions: Bivalve Molluscs, Crustaceans, Fishes, Gastropods and the General Collections, Higher Vertebrates, and Parasitic Worms. The collections of unionid mollusks and pleurocerid snails are the most extensive of their kind known.